Almost all church pastors, at some time in their church ministers, find themselves turning to the New Testament book of Second Corinthians for consolation and encouragement in times of affliction and discouragement, and for renewed zeal in continuing on in the work that God has committed to their trust. Paul, the author of the book of Second Corinthians and a model Christian leader, inspires us to give our all and our best to Christ, and to affect the world for God and for good in a small measure as he did in a large measure. 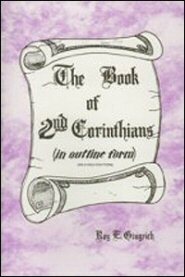 This commentary on Second Corinthians, like all other of Dr. Gingrich’s commentaries, may be used by Bible students to secure concise and correct knowledge of the subject discussed.